Curly toes is a common condition that affects infants and children and it is present from birth. The condition may become more noticeable as your child begins to walk. It tends to occur in the third and fourth toes of both feet. 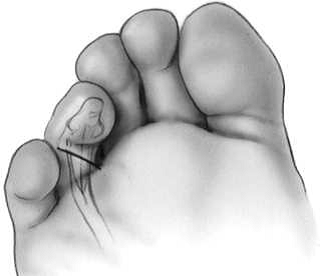 The toes curl under because the tendons that bend the toes are too tight and pull one toe under the next toe, curling it towards the underside of the foot, as is seen in the picture above. The condition is known to run in families and may be passed on from parent to child in an autosomal dominant mode of transmission, and it is thought that the long flexor tendon to the end of the toe is too tight. What are the symptoms of curly toes? Curly toes are a variant of normal and generally don’t require treatment unless they are symptomatic. In addition, there is potential for the alignment of the toes to improve spontaneously with growth in the first 5 years of life. Simple non-operative measures such as shoes with extra space across the toes may be helpful, but taping has not been shown to make a difference and is not recommended. Persistent, problematic toes beyond the age of 5 years may be treated by surgery. This involves a simple procedure under an anaesthetic, to cut the tight flexor tendon(s) which improves the position of the toes and is generally successful. Curly toes may improve without treatment as your child grows. Taping of curly toes has not been shown to make a difference. Shoes that provide extra space across the toes may be helpful. If symptoms persist , at any age, and you are concerned, a referral to an Orthopaedic doctor may be considered. Surgery, when it is necessary, involves cutting the flexor tendons to each curly toe under an anaesthetic. Biyani, A., Jones, DA., Murray, JM. (1992). Flexor to extensor tendon transfer for curly toes. Acta Orthopǽdica Scandinavica, 63(4): 451-454. Jacobs, R. &Geoffroy, V. (2007). Flexor tendon lengthening for hammer toes and curly toes in paediatric patients. Acta Orthopǽdica Belgica, 73: 373-376. Smith, WG., Seki, JT., & Smith, RW. (2007). Prospective study of a noninvasive treatment for two common congenital toe abnormalities (curly/varus/underlapping toes and overlapping toes). Paediatric Child Health, 12(9): 755-759.